The most exotic, wonderful bird Laura has almost but never seen, this distant relative of the Hamerkop is named for its enormous shoe-shaped bill. It has a somewhat stork-like overall form and has previously been classified with the storks in the order Ciconiiformes based on this morphology. 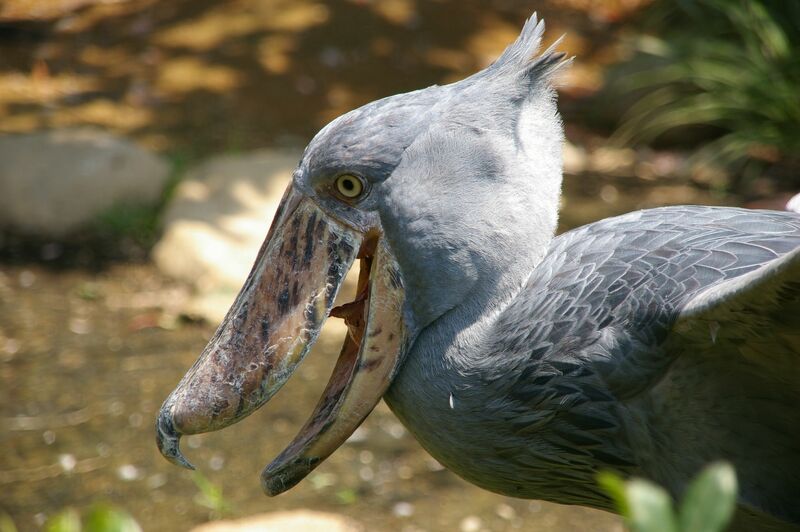 However, genetic evidence places it closer to pelicans, in Pelecaniformes. The adult is mainly grey while the juveniles are browner. It lives in tropical east Africa in large swamps. Laura’s flight was delayed on her only trip to Uganda, and she missed the first day’s trip to see these and zebras. Late in the trip, she was brought to the same marsh, but no Shoebills could be found. They tend to be secretive and shy around humans. For being such enormous, heavy-looking birds, they spend a surprising amount of time soaring in the sky, but Laura did not see this herself. In the marshes where they live, they feed mostly on fish. They can stand stock-still, heron-like, in the water or on floating vegetation.